Martinrea decided to open its newest facility in Michigan rather than Ontario. The brass at Martinrea International Inc. ran the numbers, and they added up to a no-brainer. The new technical center would be built across the border in Michigan, not in its home province of Ontario. For a company with manufacturing and engineering facilities in eight countries, it wasn’t necessarily surprising that Canada’s third-largest auto-parts supplier would make such a decision. But the reasoning was harsh. 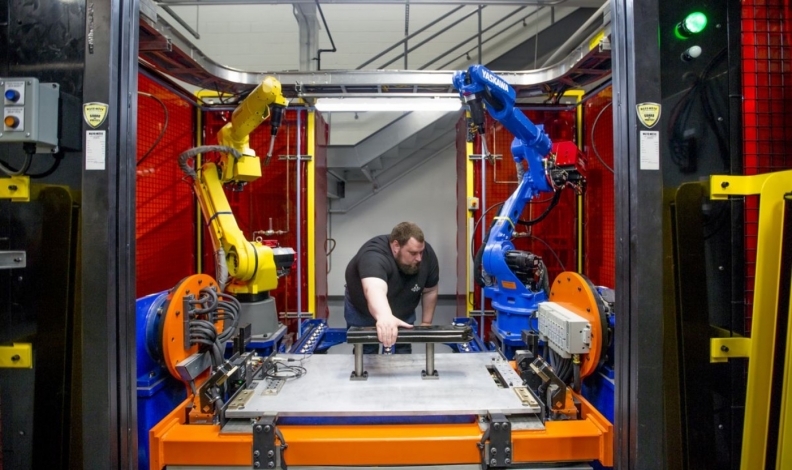 “Canada’s advantage is in the process of going out the window,” Chairman Rob Wildeboer said in an interview before the ribbon-cutting on the research and development complex in Ann Arbor that employs about 160 people. Wildeboer reeled off his evidence, including rocketing electricity costs and changes to Ontario’s labour rules, which include a 30 per cent hike to the minimum wage. While national economic growth is projected to slow this year, the U.S. economy is accelerating, getting a boost from tax cuts that he said put his country in the shade. Around the country, business owners and corporate executives are grumbling. Quebec, Alberta and British Columbia are also boosting minimum wages. The federal government is requiring provinces to put a price on carbon emissions to help fight climate change in a program that could push power bills up further. Railroad bottlenecks threaten Canada’s standing as a major commodities exporter. There’s insufficient pipeline capacity for the oil-sands boom. 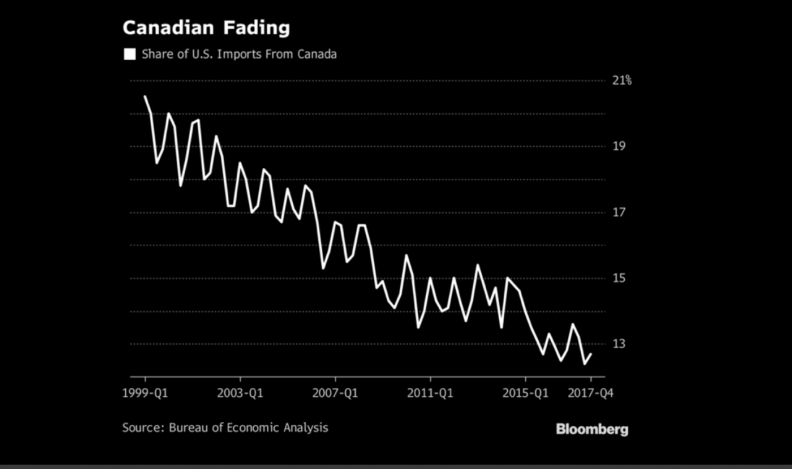 Canada has been losing its share of U.S. imports. But, according to Wildeboer and others, what threw the competitive challenges into stark relief were the U.S. tax changes championed by President Donald Trump. For years, Canada boasted much lower corporate levies. That edge has vanished. The U.S. rate tumbled to about 26 percent from 39 percent—including what states take—compared with Canada’s combined rate of roughly 27 percent. The U.S. move sparked an intense bout of reassessment of what is disparaged by some as hipster economics. After years of focus by provincial and federal Liberal governments on issues such as income inequality, diversity and the environment—with Prime Minister Justin Trudeau winning international plaudits for his efforts in these areas—a chorus is demanding that more attention be paid to old-fashioned economic growth. The answer, he said, should be obvious. He has a fair number of backers, such as Ron Mittelstaedt, CEO of Waste Connections Inc., which acquired Progressive Waste Solutions Ltd. for about $8 billion in 2016 and moved its headquarters from Texas to Vaughan, just north of Toronto—part of a wave of so-called tax inversions executed to take advantage of Canada’s then-lower tax bill. That’s hardly considered a slam by everyone in the country. In Trudeau’s view, certainly, progressive policies such as open immigration and environmental protection are advantages that many investors recognize. U.S. tech companies, including Amazon.com Inc. and Alphabet Inc.’s Google have recently boosted hiring in Canada. Toyota Motor Corp. is putting C$1.4 billion ($1.1 billion) into two plants west of Toronto so it can build hybrid sports utility vehicles, with the federal and Ontario governments each contributing C$110 million to the program. The economy is, in many ways, doing just fine. Unemployment has held at 5.8 percent for three straight months, the lowest in records stretching back to 1976. The central bank has raised interest rates three times since July, citing an economy close to its capacity. Crude oil climbed to $70 a barrel, boosting incomes in such provinces as Alberta and Newfoundland. For all that, foreign direct investment plunged last year to its lowest level since 2010, mostly because companies that include Royal Dutch Shell Plc and ConocoPhillips pulled out of the oil sands. The merchandise trade deficit stood at a record C$4.1 billion in March. And Kinder Morgan Inc. is threatening to pull out of a C$7.4 billion pipeline expansion from Alberta’s oil sands to British Columbia’s west coast unless political bickering over the project can be sorted out. Ontario recently executed the biggest overhaul to its labour code in years, extending vacation and emergency leave and tightening rules governing shift work and casual pay. The minimum wage will jump to C$15 (US$11.65) in 2019; it’s US$9.25 in Michigan. For others, the cost of power is the issue. The Ontario Liberal government shut the province’s coal plants in 2014 in the largest single reduction of carbon emissions on the continent, and sunk billions into refurbished nuclear plants and subsidized wind and solar power. Large industrial users in Toronto and Ottawa saw prices rise 53 percent and 46 percent, respectively, from 2010 to 2016, according to the Fraser Institute, a public policy research institute. 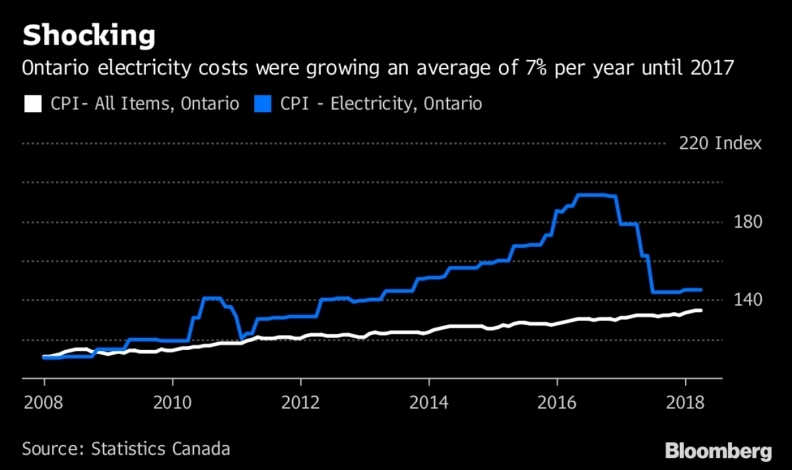 Ontario has some of the highest electricity rates in North America. And there’s the rub for Canada: Trudeau’s upbeat attitude—what he called “sunny ways”—are increasingly being pushed aside by stark economic calculations.